A new #BuildTheVisionTO report from a coalition of road safety advocacy groups also recommends banning right turns on red lights in Toronto. has lost track of the number of times she's nearly been hit by cars turning right on red lights. As someone with complete vision loss, Levy-Pinto gets around Toronto by relying on her hearing and her trusty guide dog. But the safe streets advocate and Walk Toronto spokesperson says there are constant challenges: Poor street designs, speeding drivers, narrow sidewalks, to name a few. Near-misses at red lights, she said, is what alarms her the most. "Most likely the drivers didn't even see me," Levy-Pinto said. "They just sped away, my dog pulled me back. That was really terrifying." Banning right turns on red lights, a policy that already exists in cities such as New York and Montreal, is one of 15 road safety recommendations within a new report titled #BuildTheVisionTO. It was produced by the Toronto Centre for Active Transportation (TCAT), an organization supporting safe and inclusive streets, in partnership with advocacy groups 8 80 Cities, Cycle Toronto, Friends and Families for Safe Streets, and Walk Toronto. "We know the proven solutions. It's time to build the vision," said Amanda O'Rourke, executive director for 8 80 Cities at the group's announcement on Tuesday. "We're calling on the next term of council to step up and take immediate action." The group plans to gauge mayoral and city council candidates' support for the report's recommendations — including reducing speed limits and building up the city's cycling network — by distributing a survey to gather their responses. A month before October 22's municipal election, TCAT will make the results public. The group's report follows a spate of road-related deaths in Toronto, including several deadly incidents last week alone. On Monday, a 50-year-old woman walking near Briar Hill Avenue and Dufferin Street was struck and killed in a hit and run. The following day, 58-year-old Dalia Chako died after the driver of a flatbed truck collided with her as she cycled in the Bloor Street bike lane near the University of Toronto. 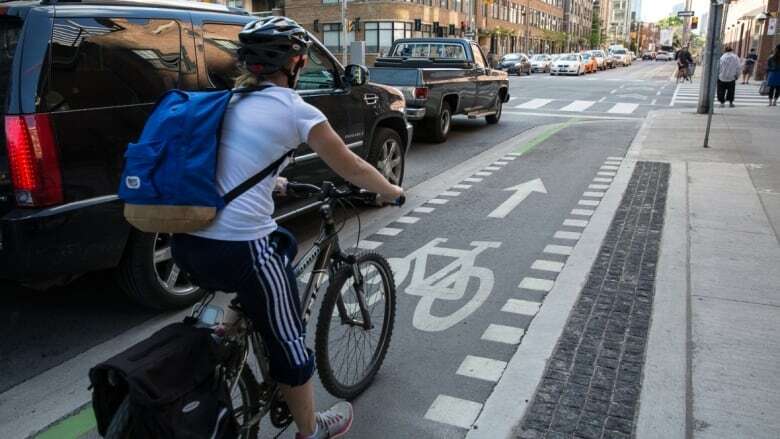 The recommendations were also released the same day Mayor John Tory moved an executive committee motion to allocate up to $13 million from the city's surplus to Vision Zero efforts, bringing the total investment to $100 million over a five-year period. Tory's motion gained unanimous support and is heading to city council for approval next week. When asked about the possibility of banning right turns on red lights prior to Tuesday's committee meeting, Tory said, "I would rule nothing out." Tory also told reporters the city is already looking into, and investing in, many of the 15 proposals brought forward in the #BuildTheVisionTO reports. One recent proposal heading to city council, for instance, aims to ensure more than 750 local schools will gain community safety zones and speed enforcement in the years ahead. Tory said he will also meet with city staff to report on Vision Zero efforts once a week. He expects the staff to provide numbers on what's being done — be it how many bike lanes were added, or how many crosswalks were zebra-painted — to boost road safety throughout the city. Implement a city-wide default speed limit of 30 km/h on all residential streets and 40 km/h on all arterial and collector roads. Streamline the traffic calming process in Toronto. Implement traffic calming in all elementary school zones by 2022. Build sidewalks on every street being reconstructed. Ensure sidewalks have a minimum 2.1 metre pedestrian clearway on all arterial and collector roads. Build protected bike lanes on main streets, including major corridors listed in the Cycling Network Plan. Build safe, connected bike routes in every ward. Accelerate the Cycling Network Plan to be built in the next four years. Increase the use of automated traffic enforcement safety cameras. Prioritize the safety of vulnerable road users by outlawing motor vehicle right turns on red. Implement controlled crossings at all bus and streetcar stops. Create an implementation strategy for Toronto's Complete Streets Guidelines. Support the Transform Yonge option for Yonge Street between Sheppard and Finch Avenues, which would reduce six vehicular lanes to four, install bike lanes, and increase sidewalk widths. Match New York City's per-capita funding for Toronto's Road Safety Plan. Support and fund a monthly Open Streets Toronto program from May to September in 2019 and beyond.